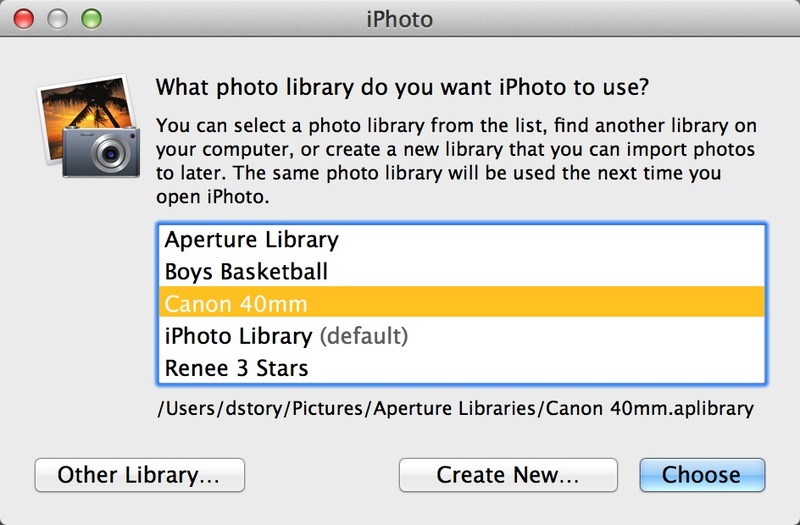 iPhoto and Aperture Libraries Unite! A terrific workflow improvement with Aperture 3.3.1 and iPhoto 9.3 is the "unified library." This means that regardless of which application creates the library, it can be opened with either app. 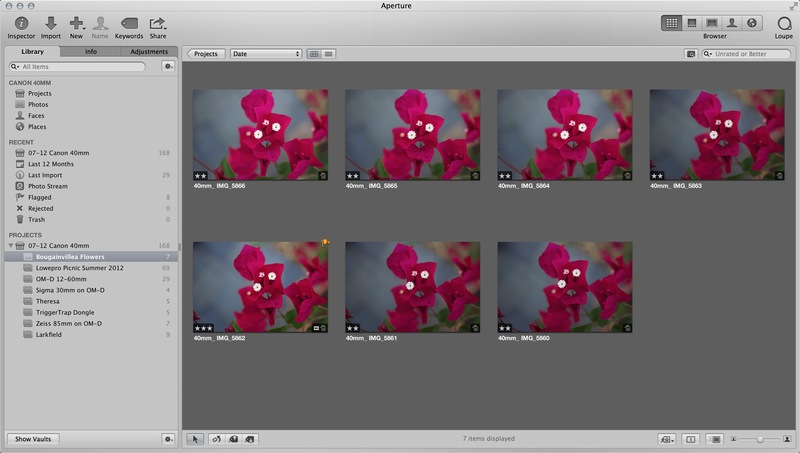 I decided to see how one of my Aperture libraries would look in iPhoto on a MacBook Pro 15" Retina Display. To test, I held down the Option key and launched iPhoto 9.3. I was greeted with a dialog box listing available iPhoto and Aperture libraries. I chose the "Canon 40mm" library, which I had created previously in Aperture. As you can see from the following screenshots, Apple has done a pretty good job of not only unifying the library structure, but also the user interfaces for both applications. So as you switch from one program to the other, the experience is relatively consistent. My star ratings, flags, keywords, and albums that were created in Aperture appeared in iPhoto. I then applied an image edit, added a keyword, and wrote a description in iPhoto. And yes, when I opened the library in Aperture, all of the changes from iPhoto appeared there. My info and image edit changes from iPhoto appeared in Aperture. All screen captures are from a MacBook Pro 15" Retina Display. Photos by Derrick Story. Overall, I had very few hiccups as I switched between the two apps. I did have one instance where my Aperture albums did not show up in iPhoto at first. So I created another album in iPhoto, then opened the library in Aperture. The new album was there, as it should. When I went back to iPhoto, now all the albums were then visible. I'm guessing this is a glitch that will be ironed out in an update. Keep in mind that you can only have a given library open in either in Aperture or iPhoto, but not both apps at the same time. I much prefer Aperture's importing process to iPhoto's, especially for Raw files. Aperture is a magnitude faster. 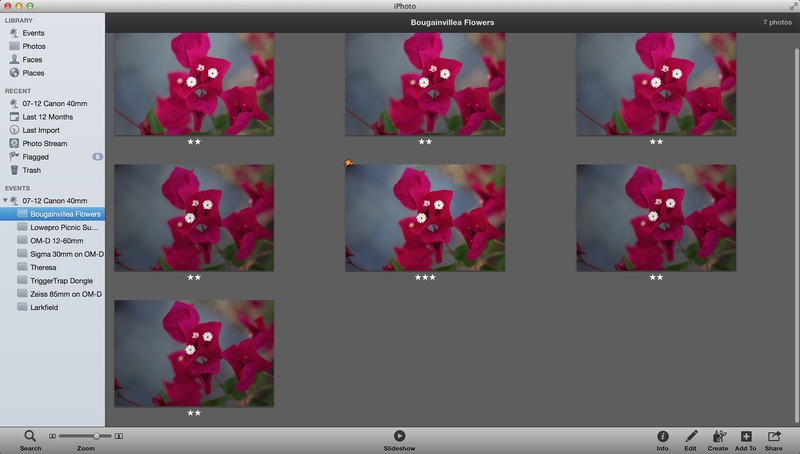 Also, you can switch between libraries on the fly in Aperture. With iPhoto, the app has to relaunch. Pictures marked as "Hidden" in iPhoto will not be visible in Aperture. In a similar vein, images marked as "Rejected" in Aperture can't be seen in iPhoto. So if you're sharing a library between apps with others, you do have some control over what appears in each. Smart Albums can only be modified in the app in which they were created, but they are visible in both Aperture and iPhoto. Just like in many marriages, a name change is involved as part of the union. A few terms have been modified in Aperture. "Masters" is now originals, "metadata" has become info, and "presets" are effects. And finally, if you have created a multitude of iPhoto libraries over the years, and you'd like to consolidate them, you can. First open the library in iPhoto to update it to 9.3. 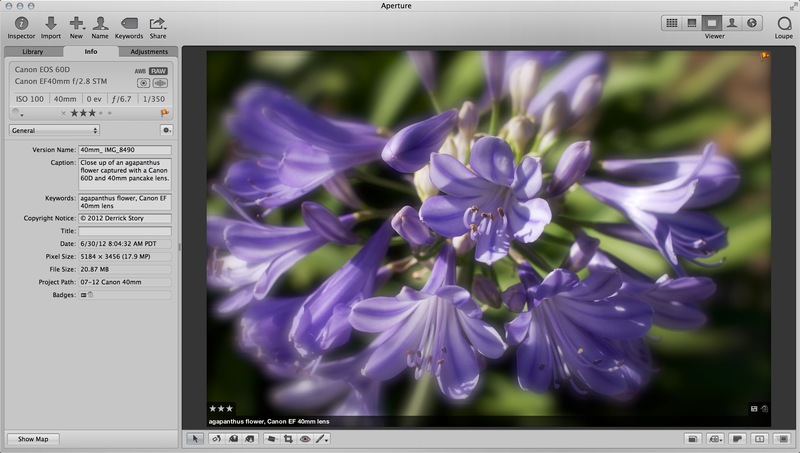 Then you can use Aperture's Import Library command to merge it with another updated library. You can do this as many times as you need until all of your iPhoto libraries are neatly organized in one unified library. As an Aperture convert, should I really keep playing with iPhoto?